She likes Dexter. She likes Breaking Bad. She’s a self-professed “goofball.” And she’s all heart. Just ask Stan Lee, as the blonde actress can not only be caught getting a peck on the cheek from “The Man,” but she can also be found these days hanging out at Stan Lee's Comikaze. She’s Darcy Danovan, and many of you would probably recognize her from the first Anchorman movie. Now that Anchorman 2 is hitting theaters this December, we wanted to catch up with Darcy to see how things have gone for her since playing "Sherry" in the first film, and what she has planned for the future. PREVIEWSworld: After winning the Ms. Nashville Tennessee title, your career had you working with charities, sponsors and national school tours, and then down the road you were cast in cast in dramas such as Confessions of a Dangerous Mind (directed by George Clooney) and Showtime (with Robert Deniro). Then you switched gears, and took on the part of "Sherry" in the comedy, Anchorman. And who would have guessed that film would take off the way that it did, leading to the sequel that’s out this December. Tell us how you got involved in Anchorman. What attracted you to this film? Was it the script? The chance to work with Will Ferrell? Darcy Donavan: Honestly, it was both. I liked the slap stick comedy of the role since I, by nature, am a silly goofball (LOL). The script was great, and it was a such a fun movie to make. The cast I worked with were awesome and so was the director, and I also wanted to show people that I can play versatile roles varying from dramatic to comedic, good and bad girl type roles. To be a successful actor you have to have versatility. PREVIEWSworld: What are some of your fondest memories of working on that film? What kind of fun did we not get to see off-screen? 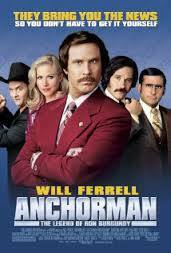 Can you describe the chemistry between yourself and the actors during the making of Anchorman? Darcy Donavan: What people don't realize is that most of the movie was improv, and keep in mind that these guys had worked on several movies with Will Ferrell before I got this role on Anchorman. They were like a fraternity of brothers before I got there, and boy are they jokesters! They love playing jokes on each other, and they were, like, big kids who would try and catch me off-guard. But I grew up around men — my dad is a football coach and I have 3 brothers. So nothing really fazes me. I could definitely hang with them! I was like one of the boys. But everyone's chemistry onset was amazing, and that I feel is what led the movie to be a blockbuster hit. PREVIEWSworld: Was doing Anchorman a different experience from performing in TV dramas like Nip/Tuck, My Name is Earl, Las Vegas (with James Caan), or Passions? Are there different demands put on you in film versus shooting a TV series? How do you adapt physically and mentally? Darcy Donavan: You have to be able to change gears as an actress. I love playing different roles. For some people it can be challenging, but I love what I do and it just seems to come naturally. I was always in drama and theater, all the way up to my senior year in high school. I always like to take on roles that I enjoy and are different, and not be type cast as doing one type of role as an actress. I think that’s important as an actress: to not stay stagnant and show producers and directors what all you are capable of doing. Heck, I was just a werewolf in my last film if that says anything! PREVIEWSworld: So this year you’ve been cast in the Amazon Studios comedy pilot Browsers (a musical comedy in the style of Broadway’s Rent), plus you’re a werewolf in another comedy by Leomark Studios. You truly love the wacky funny stuff. Was it your experience performing in Anchorman that has made you want to keep your hands in comedy? Or is it that you find making comedies more rewarding than other types of work? 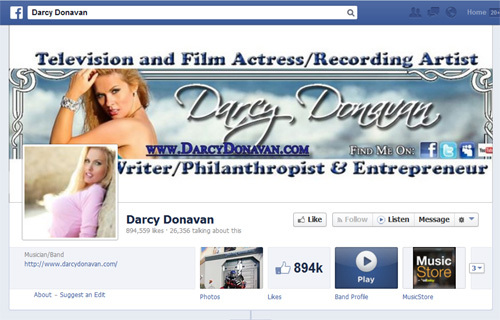 Look for Darcy on Twitter and Facebook! Darcy Donavan: Honestly, I like doing all genres. They are all rewarding. I am by nature a goofy, silly person with a feisty side as well, but comedy just comes natural. Anchorman, like I said earlier, is the kind of slap stick comedy that I personally find hilarious. I did the movie, The Mechanic, because I wanted to show people that I am in fact a very versatile actress capable of being a scary werewolf. It was something different for me and I worked with a great producer, makeup artist and film crew. And sitting in a chair for 6 1/2 hours doing makeup wasn’t easy either, let me tell ya. Once I was in full werewolf gear I couldn’t eat, drink or hit the ladies room (if ya know what I mean). But to me just being on set is reward enough because I love what I do. PREVIEWSworld: With your hand in philanthropic work, you were named World Peace Ambassador in 2009, and featured on the cover/ interviewed in the book Dream Reachers, which also featured personalities such as Clint Eastwood, Tanya Tucker, Jane Russell, and Bette Davis. Standing shoulder-to-shoulder in a book with such Hollywood titans, do you feel that this experience is an example of how the will to do good things brings about rewards you never anticipated? And is that in line with the rewards of being in a good comedy like Anchorman? The power to make people giggle opens doors that you never knew existed? Lucille Ball was one of the most powerful women at one point in the entertainment business. Her main thing was comedy and she became an icon in the business and still is to this day. I love to do comedy and I do find it immensely rewarding when you can make someone laugh. There is too much negativity in the world and I feel like comedy always shines a bright ray of sunshine for people.